Why not abandon a too prevalent conformity in the choice of vacation and getting out of the ordinary without being discouraged by cold weather? Landscapes under winter light surely unfold a different charm and fascination and journey, without considering weather conditions, comes back to be the aware pleasure of closely looking at things, taking off the film of the daily routine perspective. Far from the queues to the much crowded downtown museums let’ s adventure among the treasures of the north-eastern hills in the immediate surroundings of Florence. A rich choice, an amazing discovery of art and archeology . Villa Corsini al Castello, the Etruscan tomb at the Montagnola, the Garden of The Medicean Villa al Castello, VillaPetraia or the Manifattura di Doccia. Having already blogged Villa La Petraia (have a look on purpose on the post The Medicean Villa La Petraia “ published on Tuscany Holiday Rent blog on August 29.2012) let’s now discover Villa Corsini a Castello. Villas around Florence are excursions into the 15th, 16th, 17th century history of the city because connected to the great Florentine ruling families which witnessed in these gorgeous properties, as well organized economical systems, their standards of life, tastes, the ups and downs of their fortunes. 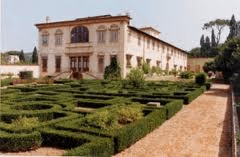 The story of Villa Corsini is quite interesting. Originally a property of the Strozzi family in the fifteenth century it was sold, after the exile of Palla Strozzi for his opposition to Cosimo the Elder de’ Medici, to the Rinieris as a ‘stately-though simple country house with a large land cultivated with vegetables, olives and grapes. The villa and its park were gradually upgraded and enlarged by Tribolo, the same architect who would later plan the garden of the Villa Medici a Castello and, above all, the masterpiece of the Boboli Gardens. After different owners in 1618 it became part of the possessions of the Medicis, more precisely of the Grand Duke Cosimo II, thus enlarging his nearby estates. 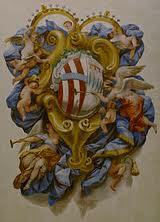 The Corsinis, another rich family of merchants and bankers bought it at the end of the 17th century. 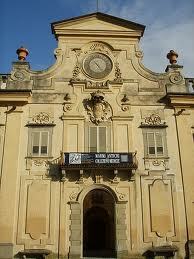 Giovan Battista Foggini renovated the villa and the garden according to the baroque style. At the center of the façade a great balcony was added underlined by the Corsini’s coat of arms and a theatrical garden divided into three areas was planned.The south section a typical Italian garden decorated with geometric boxwood beds turning around a circular stone basin, the north area including a wild wood of cypresses, oaks and laurels. French elements, among which a fountain flanked by two fan-like flights of stairs, prettily bordered by bushes and the adjacent horsehead shaped fountain, framed by scrolls and rocailles enrich this wilder area. At last the third section, the so-called “four season garden”, a theatrical semi-ellipsoidal shape setting, decorated with pillars, benches and statues of the four seasons sculpted by Isidoro Franks in 1702-03. The park includes the farm, divided by a row of cypress trees, grown mainly with olive trees and vines, reminding us the typical Tuscan landscape. 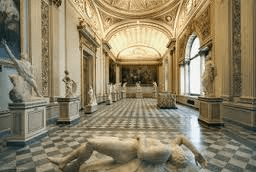 Today the villa, purchased in the 50s by the State, is an amazing backdrop for collections of sculptures and ancient epigraphs from the National Archaeological Museum of Florence. 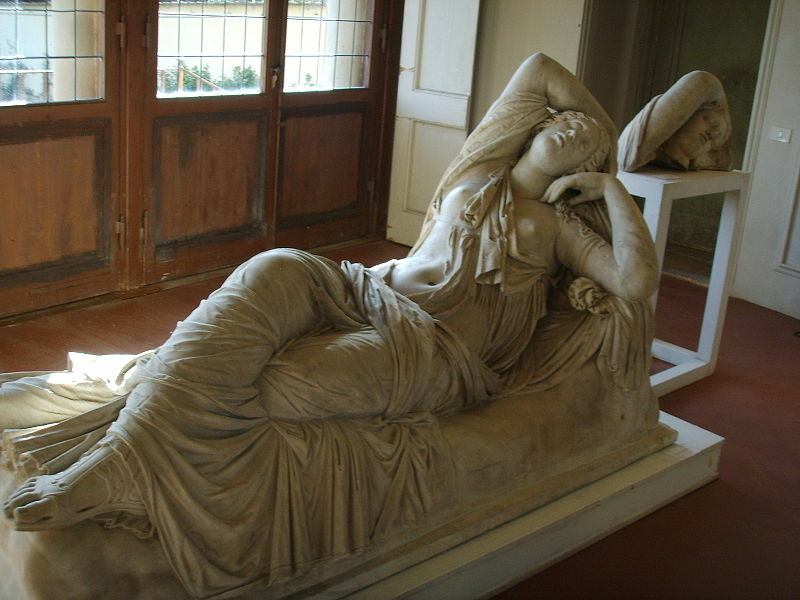 The spectacular lounge hosts Greek and Roman sculptures. Valuable the original Greek lion from a fifth century BC funerary monument and the great Roman statue of the “Sleeping Arianna”, copy of a Hellenistic original sculpture. Particularly interesting the Roman replica of an original second century B.C. work featuring Niobe pleading for her last survived son against the wrath of Apollo . The mythological Greek character sung by Homer and Ovid stands here in her eternal punishment for having challenged the gods. From Greece and Rome a turn to the Etruscan world, whose remains adorn the courtyard of the villa, inviting visitors to silence and meditation. Questa voce è stata pubblicata in Art and accommodations e contrassegnata con GiovanBattista Foggini, IsidoroFranks, Sleeping Arianna, Strozzi family, Tribolo, Vila Corsini a Castello, Villa Petraia. Contrassegna il permalink.